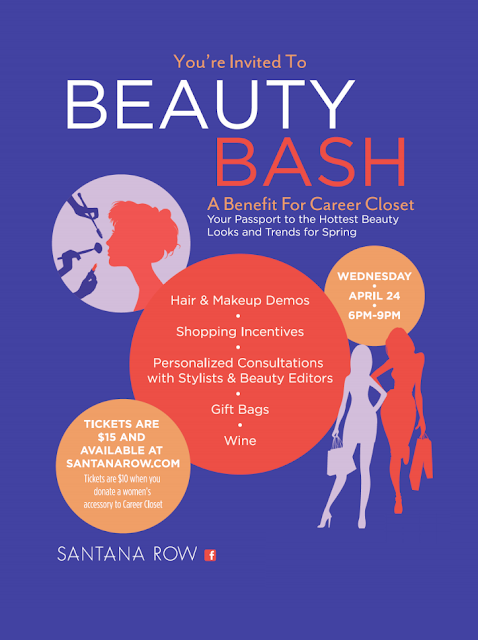 San Jose, CA – A first time event that brings together pampering and primping for a good cause, Santana Row is hosting a Beauty Bash of fashion fun with style experts, retailers and salons to raise money for Career Closet. The public is invited to shop, nibble, and enjoy cocktails and wine while talking to style experts and fashion bloggers who will be stationed in various stores to offer advice on the best looks for spring. Guests can try the latest hair and make-up trends from professionals and receive personalized consultations on how they might work best for them. Tickets are $15, or $10 with the donation of a gently used accessory (jewelry, bags, scarves) and available at SantanaRow.com. Guests receive a "passport” for in-store events, a wine glass (wine will be poured in the stores) and a swag bag of goodies. Proceeds go to Career Closet, a non-profit organization based in Silicon Valley that gives disadvantaged women advice, confidence and appropriate work attire donated to the clothing boutiques it operates in San Jose and Foster City. Beverly Zeiss, Red Haute & Co., is a former model who’s been involved in the fashion industry throughout California for many years, Zeiss is Santana Row’s Fashion Consultant/Director who produces the annual fashion shows. Her company produces several other events, including social, fundraisers and charitable organizations. Traci Halvorson, Halvorson Model Management, has been part of the modeling industry for more than 25 years. She’s a Northern California native who owns and operates HMM- Silicon Valley's Top Model Agency. She advises, promotes and represents hundreds of professional models in the San Francisco Bay Area. Cathy O’Brien, Bay Area Fashionista, is the editor of local blogzine BayAreaFashionista.com. She has more than ten years experience working in the fashion industry and is active in the local philanthropic community and is a sustainer in the Junior League of San Jose. Rommellyn Fisher, The Stunning Post, is a native of San Jose with a background in hospitality. She’s always had a passion for the fashion industry, styling friends and clients as well as being a make-up artist. It led her to create The Stunning Post, a local blog focused on fashion, beauty, entertainment and lifestyle in the Bay Area. Jenna Ghosheh, Status Image Consulting, is an Ivy League-educated style expert to Silicon Valley’s movers and shakers. She marries the current trends of American fashion to the varying body types, style preferences, and ages of her clients, all within the modern Silicon Valley culture. Jenna has been a guest lecturer at style events and worked as producer and stylist to many Bay Area fashion shows. Dale Janeé Steliga, Savvy Spice, is a San Francisco fashion stylist and founder of the style blog, SavvySpice.com. Last year, she was a stylist for the Bravo show, “Startups: Silicon Valley” and just launched Savvy Sleepers, the world's first line of unisex luxury satin pillowcases for smoother hair and healthier skin. Dale tailors her blog posts and fashion columns on how capture celebrity looks and beauty secrets for less. Tricia Santa Ines, Pink Stripes Boutique, owns the Santana Row store that uniquely combines her two passions for fashion and food. Tricia has designed clothes and handbags for bebe and Whiting and Davis as well as tableware for Williams-Sonoma. Pink Stripes Boutique celebrates 10 years in business, and is the go-to place for hot fashion and sweet treats. InSpa, Beau Bijou, Atelier SalonSpa, Furla, 100% Pure, LOFT, Flying Lizard, Lavande Nail Salon, Drybar, Ted Baker, Pink Stripes Boutique and Free People. The organization’s mission is dedicated to giving disadvantaged women fundamental occupational and presentation skills through operating not-for-profit women’s clothing boutiques. Career Closet was founded in 1992 by two volunteers at O’Connor Hospital in San Jose. At the hospital, they met women who needed to return to work and had no appropriate clothing. So, they began asking local women to donate their gently used suits and business attire so women leaving the hospital could have the necessary clothing to return to the workforce. Career Closet now recycles thousands of pieces of donated, work-appropriate clothing every year and gives them to low-income women. With a staff of volunteers and with the help of partner agencies, it helps identify clients who otherwise would have a tough time returning or entering the workforce. Donations are accepted at two location: 43 E. Gish Rd., Suite 100, in San Jose and 1163 Chess Dr., Suite A, Foster City. For more information, go to careercloset.org. dining, living and nightlife. Surrounded by landscaped gardens, parks and plazas, Santana Row features over 70 retail shops, more than 20 acclaimed restaurants, a 212-room boutique hotel and six-screen movie theatre. In addition to the dynamic retail collection, Santana Row offers 622 residential units featuring a fitness center, rooftop pool and resort-living accommodations, and 65,000 square feet of office space at 300 Santana Row, its newest office address. Santana Row is a property of www.federalrealty.com (NYSE:FRT), headquartered in Rockville, Maryland. For more information, please visit www.santanarow.com.